lham Baru Tower (also known as IB Tower) is a skyscraper strategically located at Jalan Binjai near the famous Jalan Ampang in Kuala Lumpur, Malaysia. This office tower near KLCC has 60 floors and 275 m tall, is the fifth tallest infrastructure in Malaysia after its completion in 2015. IB Tower which is 60-storey is a new iconic landmark in Kuala Lumpur Central Business District. 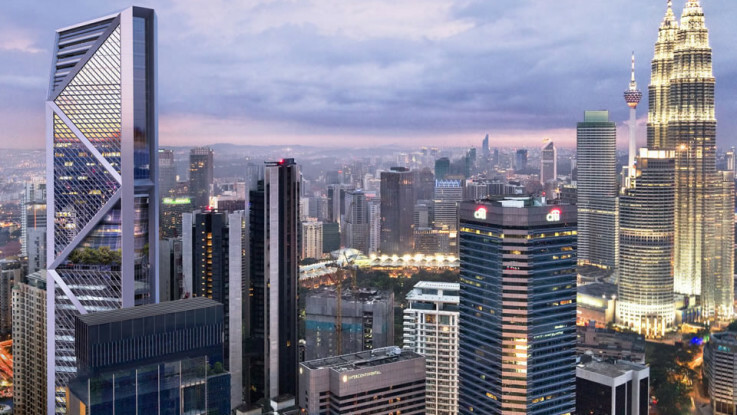 IB is designed by the world famous Foster+Partners, with Corporate Offices and Serviced Apartments as its main components (33 will be dedicated to the office suites, while 22 are for the serviced apartment units ). There is also a food court, a business centre an art gallery, a convenience store, a banking hall, a cafe, as well as other facilities to meet the corporate needs.. The desire for column-free space is one of the building’s unique facade. The exterior of this brand new office tower is then said to be designed with the idea of shading the interiors. The Grade-A office building is designed to Greenmark Gold + specifictions, MSC Compliant and promotes workplace efficiency and convenience catering to the changing needs of the corporate world. In additional, there is high-number of parking bays, to serve the drivers to and fro the building. A total of 913 parking bays are available to the tenants andd visitors of Ilham Baru Tower. Located along Jalan Binjai, lham Baru Tower is within KL’s Golden Triangle and at the fringe of KLCC. This KLCC office is only 3 minutes walk from Ampang Park LRT Station. The 3 meters floor to ceiling height and floor to ceiling windows portray spaciousness whilst taking advantage of the natural sunlight. The column-free floor plates allows efficient usage of layout and variety of design. Besides, the high-speed lifts and the technology of the building security system which offers a sense of security and premiership . IB Tower’s business guests and partners will finds it convenient as IB Tower’s serviced apartment integrates extremely well in the development concept. All 220 units is managed by a renowned hospitality operator.Obviously, this property is an architectural dream. In addition, the height of this building means that the top floors are ideal spot to catch the city skyline. Some of its hotel-like facilities and attractions are such as the art gallery, giving a cathartic opportunity for art lovers at Ilham Baru Tower. Not forgetting potential office tenants, meeting rooms, auditorium, courier service and banking hall are some other facilities that can entertain a few corporate needs. This KLCC office is one of the popular choice as it commands a strong branding approach. Office spaces available are from 2,314 sf to 13,886 sf per floor plate. Total floor space for rent or lease is approximately 400,000 sf.